2015 Toyota Aygo 1.0 X-pression X-wave review | What Car? Toyota is preparing for the warmer months with the launch of the Aygo X-wave soft-top. The X-wave, rather than being a completely new model, is really an £895 option that can be added to five-door X-pression models, bringing the on-the-road price to £11,890. In turn, the Aygo is essentially the same underneath as its main rivals the Citroën C1 and Peugeot 108, but with different equipment levels and styling. So, how does the Aygo X-wave measure up to its soft-top sister cars and other rivals such as Fiat's 500C? What is the 2015 Toyota Aygo X-wave like inside? To put the Aygo’s exterior proportions into context, it is over 100mm shorter than the Volkswagen Up. It's surprising, therefore, just how much space there is around the two front seats. Even if you are over six-feet tall there is enough seat travel to give plenty of leg room, and the height-adjustable driver’s seat means that there’s also plenty of head room. The seats themselves are well shaped and comfortable, but do lack decent bolster support. The steering wheel adjusts up and down, and the instruments move with it, so there’s always a clear view of the dials. It’s just a shame that there’s no reach adjustment, because with the seat fully back it means your arms are at full stretch. The dashboard is attractively styled and includes a 7.0in touchscreen, a rarity in this class. However, together with the door trims, it is made of cheap-feeling plastics. Fortunately, body-coloured detailing provides some welcome contrast. It works well enough with straightforward menus and clear graphics. Our test car featured an integrated and well-thought-out optional (£395) sat-nav. This sat-nav is unique to the Aygo. The C1 and the 108 make do with app-based systems which, although cheaper, don't work as well. The X-Wave isn’t a true convertible. The canvas roof is effectively a large sunroof that opens from the windscreen back to the tailgate. To retract it is easy and requires just the push of a button next to the rear-view mirror. It takes only a few seconds to slide back. There’s no loss of rear visibility with the roof open, while it makes the already airy cabin feel lighter still. It goes back far enough to allow rear-seat passengers to feel the benefit, too. That said, there's not much room back there. Even teenagers will feel hemmed in; leg room is particularly tight. Meanwhile, with the roof closed, there's not much head room. The boot is the same size – 168 litres – as the standard Aygo's. It's quite small and has a big lip to negotiate when you're lifting items in and out. You can drop the 50:50 split-folding rear seatbacks to create more space, but doing so leaves a stepped load bay. The X-wave is available only on the mid-spec X-pression trim, which means it comes with a decent amount of standard kit. For instance, it has LED daytime running lights, foglights, 15in alloy wheels, a rear-view camera, Bluetooth and a DAB radio, plus the touchscreen mentioned earlier. It also has a competitive suite of safety features, some of which helped the Aygo achieve four stars in the Euro NCAP crash tests. These include six airbags, stability control, a speed limiter, ISOFIX anchor points, hill-start assist and tyre pressure monitoring. What is the 2015 Toyota Aygo X-wave like to drive? The driving experience is much like the hard-top version, but with the roof closed there’s noticeably more wind noise from the leading edge of the canvas. With the roof open you are well insulated from buffeting at town speeds but when motoring along B-roads the draft increases and the cabin becomes blustery. Shutting the roof halfway makes this more tolerable. The only engine option is a 1.0-litre VVT-i petrol. With its three-cylinder arrangement it’s quite vocal and transmits a fair degree of vibration through the controls. Pottering around town the motor performs well enough, but with only 69bhp, if you’re climbing a hill or joining a motorway it does need to be worked hard. This means lots of gear changing, so it’s a good job the five-speed manual transmission is light and precise. 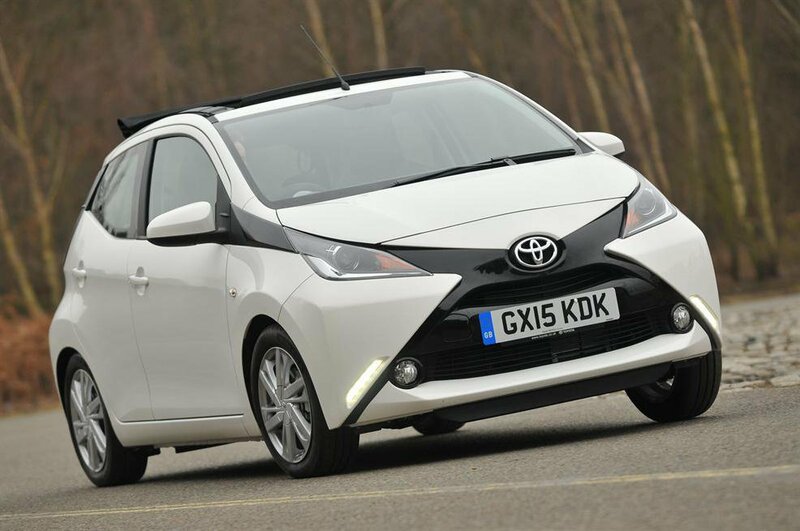 Once up to speed on a level road, the Aygo will happily maintain a 70mph cruise. It's easy to maneuver in town thanks to those dinky proportions combined with light and accurate steering. On more flowing roads it also handles well, displaying a reasonable amount of grip and body control, although at these speeds the steering could do with more feel. Sadly the ride tends to be fidgety over uneven surfaces and rarely settles down, but at least it avoids being crashy, even over larger potholes. If you are looking for a city car that gives you the option to enjoy open-air motoring, apart from the cars mentioned above, there aren’t too many alternatives. The Fiat 500C is a fun, desirable and a perfectly capable car, but it's a fair bit more expensive. Even working to our Target Price it will require a budget of over £12,500. So, if you’re budget doesn't stretch that far, it’s a case of which is best - the open-top versions of the Aygo, C1 or 108? For many, it will simply be a case of which one you most like the look of, as everything else about these cars is broadly similar. They all drive in a near identical fashion, have the same engines and similar interior ergonomics. However, on the basis that the Aygo is more expensive (by around £1000 like for like) and despite its slightly higher level of standard equipment, we would recommend trying the C1 or 108 first.